*I apologize for anyone I offended with the title of this article. My 12-year-old side just couldn’t help it. Welcome to the Jerk(y)-Off. Who needs a bake-off or a chili-off when you can have a jerk(y)-off? 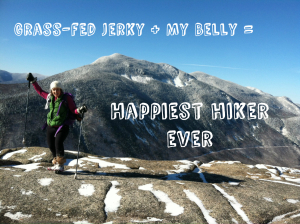 I have spent all fall putting together a list of meat jerkies that get my approval as a healthy, sustainable and delicious food option for backpackers all around the country. Enjoy! BECAUSE I CARE ABOUT THE ENVIRONMENT AND MY BODY! If I am going to take 5 months of time off from work to do something so incredibly life-changing, why would I eat terrible, toxic food in the process? Being on the trail for me is about reconnecting to nature, exploring a simpler life and giving my body a chance to heal from years of stress, processed foods and unhealthy environmental toxins. Although poptarts sure are tasty (cinnamon flavored… yum), eating them on the trail defeats my higher goal of trying to live a more sustainable, natural and holistic lifestyle. Your goal may not be health-minded, but I truly encourage EVERYONE to invest some time and money into finding the healthiest backpacking food options possible. Happiest girl in the mountains. You are helping to save the environment from toxic chemicals and byproducts created by factory farms, pesticides and feed lots. You are giving your body more bioavailable (easier to absorb and use) nutrients that will keep you hiking longer and faster. You are investing in your health. I’d rather pay 50 cents more now than get sick, develop diabetes, arthritis or heart disease later on! You are supporting small farms and companies that invest their money and technology into sustainable agriculture, nutrient-dense foods and healthy livestock! Although I’ll be reviewing other nutrient-dense food options in the future, this article is going to focus on meat jerkies because for me, they are going to be a major part of my diet while on the trail. 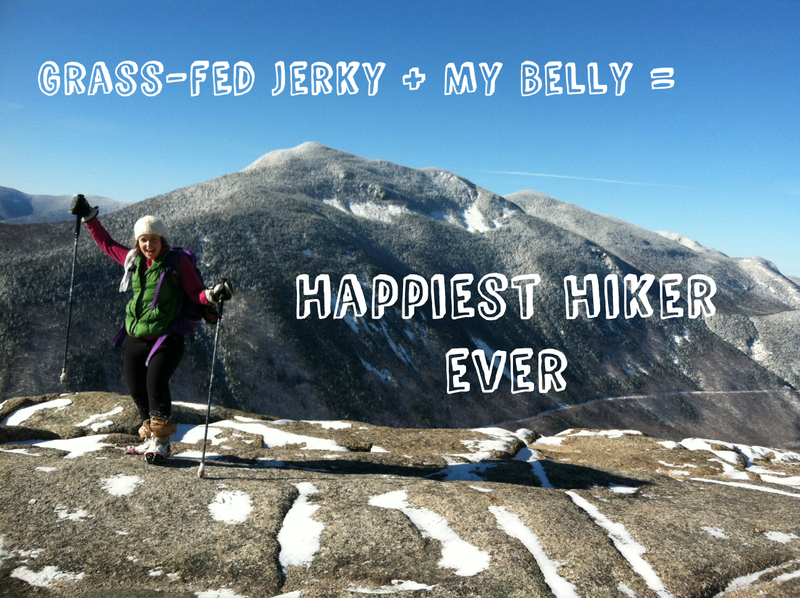 Grass Run Farms– I am in love with their meat sticks and beef jerky (my hiking buddies can’t get enough of these too). They all smile when I pull out a Grass Run Farms product. Their (Grass Run Farms, not my hiking buddies) meat sticks come in three varieties: Original, Jalapeno and Smoky Sweet. I love them all, but have a special place in my heart for Jalapeno. Their other preserved meat products are also fantastic and a special treat for the trail. Epic Bar– Epic Bar has managed to do the impossible. They created a meat bar that has the texture of a fruit and nut bar. Like all the products on this list, they use pasture-raised meats, as well as organic fruits and nuts in their bars. Epic Bar has a new product though that I literally salivate thinking about- their hunter gatherer trail mixes. They are worth every penny, and a completely perfect, sustainable, and nutritious meal option for backpackers as well as for everyday use as well! Salt, Fire and Time– The owner, Tressa, is incredible. Her mission is fierce and her nutritional philosophy is spot on. I approve of anything and everything on her website, but I’ll be taking along her Citrus Cured and Kimchi Beef Jerky. Added bonus? Her products are completely soy and sugar free. Each bite is truly nutrient-dense and made with love. I can’t wait to open up my resupply boxes and see these inside. Blaistix- What I love about this company is that all of their meat is sourced from small 100% grass-fed cattle farms. When I’m buying Blaistix, I’m also helping a family send their kid to college, not to the latest yacht festival. They have five varieties: Hot Spicy, Sweet Savory, Chipotle Adobo, Mild Mannered and Coriander. I always love my spicy varieties, but their coriander flavor is something special. Give it a try! On-the-go Paleo Organ Stick- Now this baby is going to revolutionize organ meats forever. You may be thinking to yourself… gross. Which honestly, is totally fair. But seriously, you cannot taste the difference. You’ll never notice that you are eating a less popular part of the animal. Not only are organ meats high in protein, but they are usually anywhere between 2-20 times higher in minerals and vitamins. You get the biggest bang for your buck, health-wise, by biting the bullet and eating these organ sticks along the trail. I try to get in a little bit of organ meat every other day during my non-hiking life, and I’m going to use these to continue that practice. Mountain America Jerky– I love this company for their variety of meats. On my last hike, I ate some kangaroo, alligator and wild boar. They taste fantastic and are so much fun to get your friends to sample. It’s important to me to vary the meats I eat day to day on my hike, as I do in my real life. The bigger variety of meats, foods and species you’re eating, the bigger variety of nutrients you will be consuming! Vermont Smoke and Cure- Because these are so local to me (and so delicious), I eat their turkey variety almost every day as a snack. Although they use locally raised beef and pork, it’s not guaranteed to be grass-fed, so I stick with the turkey variety. I love their Ancho flavored RealStick and will happily be devouring these along the trail. Perky Jerky- Their turkey jerky is fantastic. They have four varieties that I totally approve of: Original, Hot and Bothered (my favorite, of course), Sweet & Spicy and Teriyaki. Again, this company doesn’t use grass-fed beef, so I stick with the turkey variety. This is another one that when you open the package, all heads and salivating mouths will turn to you. You just have to celebrate the good news. 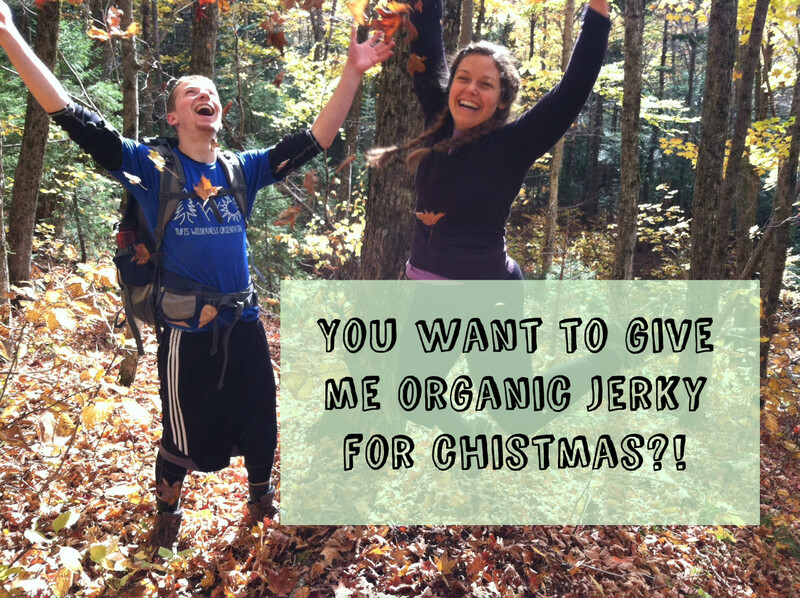 Need a holiday gift for a friend or family member hiking the Appalachian Trail? I’m sure they would love to see a couple boxes of these jerkies arriving around the holidays! Do you have a favorite grass-fed beef or other animal jerky brand that you recommend? Comment below! I would love to find out more about other companies that are creating incredibly nutrient-dense products. Thanks for this! We make our own jerky with grass fed beef that we get from a local farmer. Along with not having nitrates/ nitrites we don’t use sugar. That might not be a problem on the trail, but we do 2 whole30’s a year and can still eat it. I am also hoard EXO bars that are made with cricket flour. They are relatively high in calories and fat for a small package IMO. Check them out! This was a great read and interesting article. I am an avid hiker and outdoorsman. I started an online jerky shop to cater to folks who wants an alternative healthy snack for while hiking, biking, boating, or just about anything to sustain your energy level up. 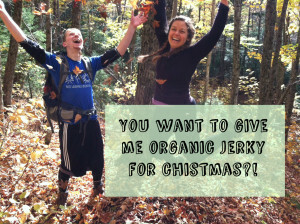 Please go to http://www.4seasonsjerky.com for our discounts and promos and try out the flavors for yourself. They are delicious.